Independence day Photography Competitions 2017 by India Post, Independence day Photography Competitions 2017 theme, last date for sending the Photographs: Entries are invited for the Photography Competition on the occasion of Independence Day 2017. The theme of the competition is ‘Beautiful India’. The participants are to take original snap on the subject (should not be copy of picture snapped by someone else). 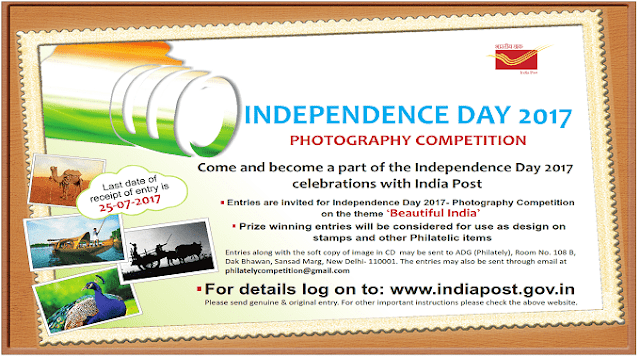 Come and become a part of the Independence Day 2017 celebrations with India Post. Entries are invited for Independence Day 2017- Photography Competition on the theme ‘Beautiful India’. Any citizen of India of age group 18 years or more can participate in this contest. Participants can send only one snapped photograph on the subject. The photograph submitted should be such that can be depicted on the stamps in a visually appealing manner so as to be of interest to philatelic collectors. 1. Participants can use only photographed paper of A4 size. 5. An undertaking stating that ‘The photograph submitted is original and no copyright issues are involved’ should be sent along with the entry. In case of any legal dispute related to copyright issue, Department of Posts will not be liable for the same. “Photography Competition - Independence Day 2017” on the envelope in which the photograph is sent. 7. The entries should not be of provocative or objectionable nature. It should not be aimed at ridiculing or hurting the sentiments of any sections of the societies. The entries shall not give rise to any discoid, disharmony and will not have any graphic content of unpleasant or objectionable nature. 8 . The entries should reach on the following address by 25.07.2017. The entries received after last date of receipt will not be entertained. Prize winning entries will be considered for use as design on stamps and other Philatelic items Entries along with the soft copy of image in CD may be sent to ADG (Philately), Room No. 108 B, Dak Bhawan, Sansad Marg, New Delhi- 110001. The entries may also be sent through email at philatelycompetition@gmail.com.